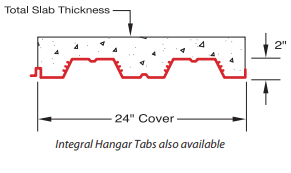 Type 2” composite cellular deck is utilized in exposed ceiling areas where a flat bottom deck is desired for aesthetic purposes under a slab and the spans exceed the capability of type 1-1/2”composite cellular deck. Notes: 1. Load tables are calculated using section properties based on the steel design thickness shown in the Steel Deck Institute (SDI) design manual. 2. The minimum exterior bearing length required is 1.5 inches. Minimum interior bearing length is 3 inches. If these minimum lengths are not provided, web crippling must be checked.